“Maria Vitale studied with the renowned Giannina Arangi-Lombardi in Milan. At first it was assumed that her voice was that of a coloratura soprano, however upon the recommendation of composer Riccardo Pick-Mangiagalli, she turned to the dramatic soprano repertoire. After singing in the ‘Martini-Rossi’ concerts on Italian radio, she appeared as a guest at the Paris Opéra in 1950 to considerable success, singing Norma, Leonora, Amelia and Aida. 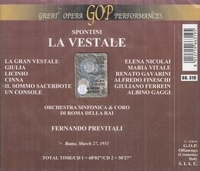 In 1951, the year of Verdi's 50th death anniversary, she sang major parts in lesser known Verdi operas for RAI, notably; Leonora in OBERTO, Giselda in I LOMBARDI, Lucrezia in I DUE FOSCARI, and Mina in AROLDO. She continued singing in Italy, appearing in Palermo, Florence, Turin, Trieste, etc. In 1953, she sang the title rôle in ELISABETTA, REGINA D'INGHILTERRA on Italian radio, and appeared at the Edinburgh Festival, as Desdemona in Rossini's OTELLO. Other rôles included Senta and Elsa, she was also a successful interpreter of Lieder, a rarity among Italian singers, and appeared in recital in Stuttgart, Frankfurt, and Berlin.